U.S. Forest Service | Special to the Daily Pile burning operations in winter of 2017-18 in the Dillon Ranger District in Summit County helped reduce fire fuels. 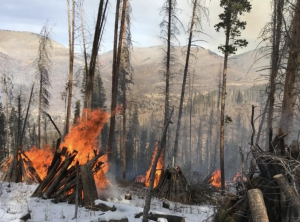 GLENWOOD SPRINGS — Fire managers from the Upper Colorado Interagency Fire and Aviation Management Unit are taking advantage of weather conditions to burn slash piles that are the result of multiple fuels reductions and hazardous tree removal projects. Pile burning will take place at several locations across the Dillon and Eagle-Holy Cross ranger districts in the White River National Forest in Summit and Eagle counties. Slash piles have been created for burning in project areas where other means of disposal are not feasible due to steep slopes and lack of access. These projects were conducted for hazardous fuels reduction in the wildland urban interface and to improve wildlife habitat. 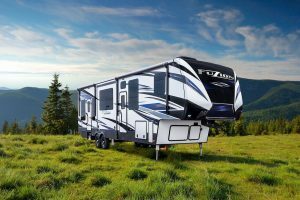 Hazardous fuels reduction projects create fuel breaks that help reduce the risk of wildfire, while giving firefighters a safer place from which to defend homes and communities. Firefighters will spend the upcoming winter months burning piles in a number of locations across both districts. Crews may burn 10 to hundreds of piles per day. These prescribed fires will be ignited when fuel, weather and smoke-dispersion conditions permit fire specialists to burn in an effective and safe manner. Additionally, when piles are burned with snow on the ground, there is an extremely low chance of the fire spreading to adjacent vegetation. Local residents and travelers through the area should be aware of the likelihood of smoke rising from these areas. Most of the smoke will dissipate during the day. 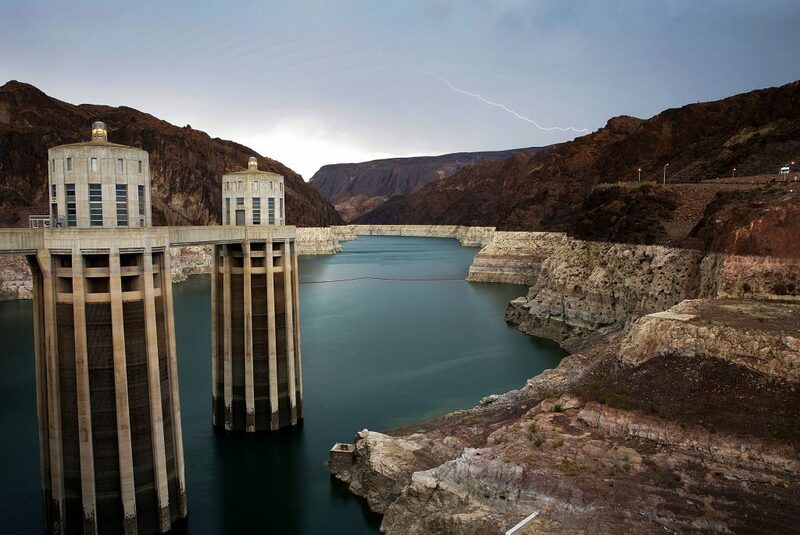 However, some nighttime smoke may remain in valley bottoms and drainages and is expected to be short in duration. Public and firefighter safety is always the main priority during firing operations. • Dillon Ranger District: Specific locations for pile burning, when conditions warrant, include Highlands subdivision in Breckenridge, near Tiger Road and State Highway 9, Swan Mountain Road, Keystone Gulch and Montezuma Road. Additionally, Arapahoe Basin Ski Area will be conducting slash pile burning as conditions allow. 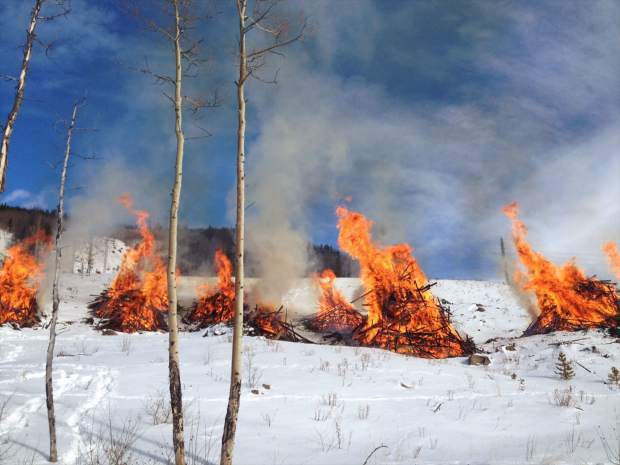 • Eagle-Holy Cross Ranger District: Specific locations for pile burning when conditions warrant include Vail Intermountain in West Vail and Piney Salvage near Red and White Mountain north of Vail. Prescribed fire smoke may affect your health. Taking individual responsibility to reduce flammable materials around homes and communities before a fire occurs can help keep the public and firefighters safe. To learn what you can do on your private property to make it fire wise go to: http://www.firewise.org.